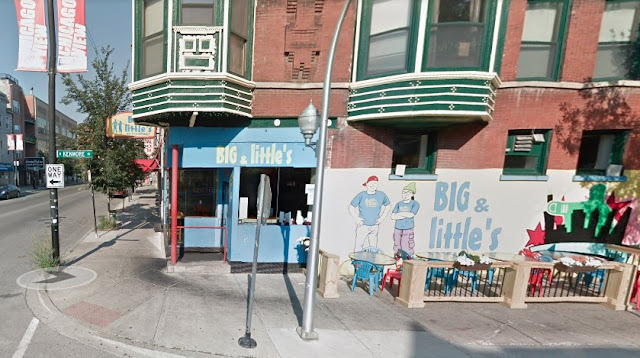 Detectives are investigating the Thursday morning armed robbery of Big & Little’s restaurant, 1034 West Belmont. Two men, both armed with handguns, entered the eatery just before 11 a.m. and demanded the store’s proceeds, police said. Minutes later, the duo ran out the door, sprinted past a gaggle of daycare kids and sped away in a silver four-door car that was last seen heading southbound on Kenmore. A group of children from the nearby L & L Academy and Preschool crossed paths with the escaping suspects. In a letter to parents, the school said a group of children “was walking back from Martin Park to L&L when two men ran out of Big and Little's and sped off in a silver car….The men ran past the [children] diagonally (away from them) in the ally [sic] behind Crystal Cleaners,” at 1024 West Belmont. In August 2016, L & L took the proactive step of having lockdown drills and teaching children “a get low song” to help them remember what to do if there’s “ever an extreme situation with gun violence.” The safety measures followed three shootings near the school within a week. 2) Male, black, 5’10” tall, orange or red hoodie, gray sweatpants, white gym shoes. He may have braided hair.